Ninh Binh or Tam Coc? Before we start with the highlights, it seems helpful to clarify the confusion about both locations, Ninh Binh and Tam Coc. 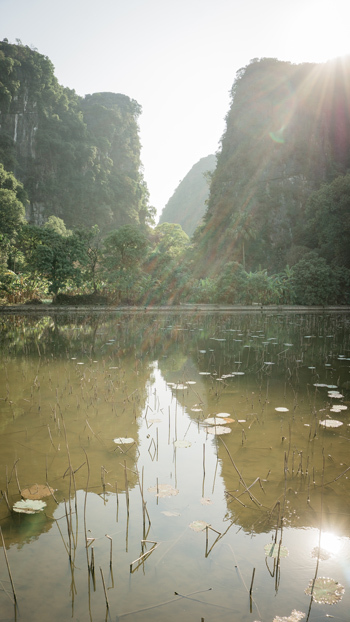 Ninh Binh is a beautiful province about 60 mile south of Hanoi. The confusion arises because of its similarly named busy capital, which in itself has little to offer. The village of Tam Coc on the other hand immediately exudes the natural beauty of this region. 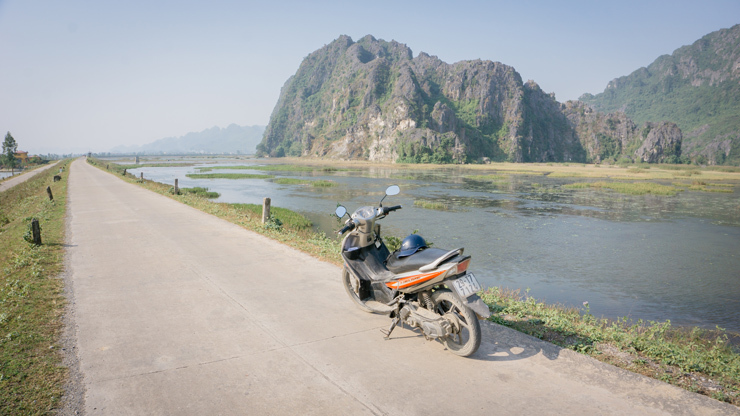 It is located only a few miles south of the city of Ninh Binh but the contrast can’t be more apparent. 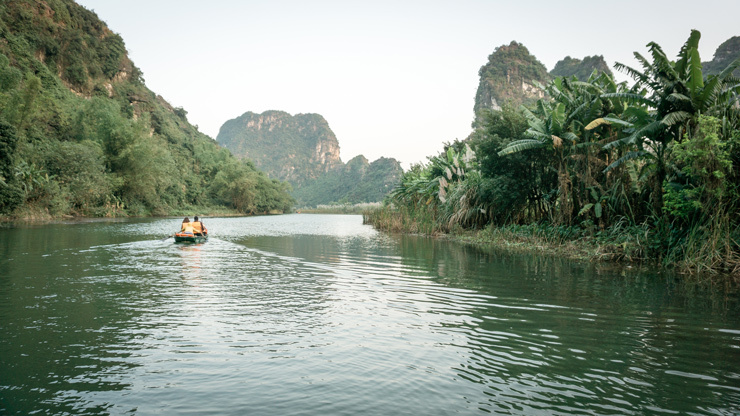 In Tam Coc – and as a matter of fact in other nearby villages of the countryside – the massive green-covered limestone rocks overshadow the beautiful rice fields and picturesque streams. Here the countryside and nature dominate. 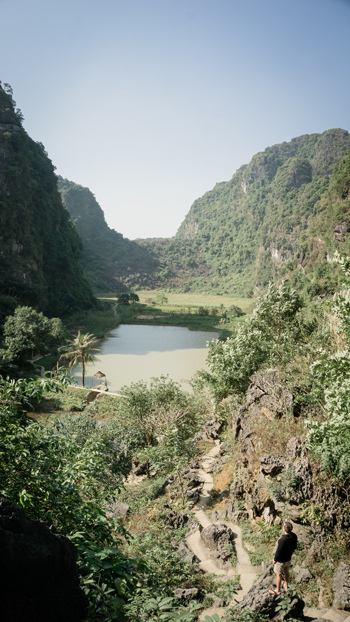 That is exactly why the Ninh Binh region is one of the most beautiful in Vietnam. 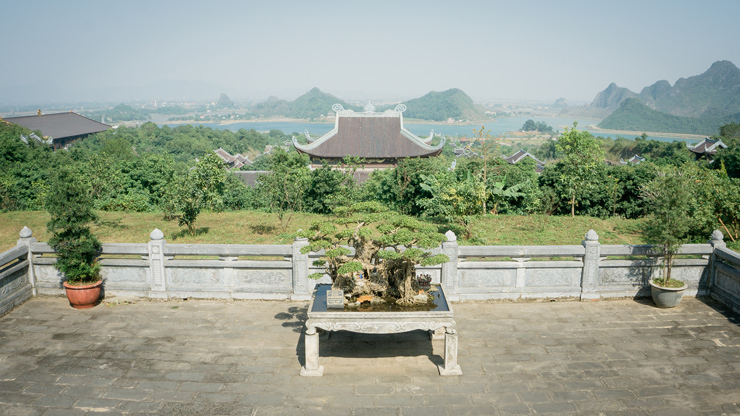 Let us be clear: discovering Ninh Binh is not just about the main important attractions. This fascinating area rather offers a total experience. That’s why we’d recommend renting a motorbike or bicycle and providing sufficient time between the stops. It will cost you about 10 USD a day for a motorbike and 5 USD a day for a bicycle. Just drive, enjoy the views and regularly stop at the many photogenic spots. No, you won’t get tired of those fierce limestone rocks. This in itself is a wonderful experience. Yet there are some highlights which certainly can’t be missed during your adventure in Ninh Binh. We are happy to share them with you! We recommend spending two days exploring this breathtaking setting. In the wider area, you can choose between different boat trips. Eventually most visitors struggle with the choice between these in Tam Coc and Trang An. We consciously chose the one in Trang An. Although both lead you through the same beautiful landscape of fascinating limestone cliffs, you immediately notice that the trip in Tam Coc is much more commercial. The hustle and pushy saleswomen make this painfully clear. Trang An is no longer unknown, but still you can peacefully enjoy the natural beauty in December. However, the hundreds of empty moored boats lined up at the wharf make us suspect that it might be a whole different story in peak season. [Unfortunately, we can’t confirm nor disprove this. If someone did the boat trip in high season, we would love to hear your experience!] The trip in Trang An also takes you through several caves and follows a loop route, while you row back and forth in Tam Coc. Tip: Take the tour in the late afternoon. The day trippers have already left and you’ll be treated to dazzling reflections in the water! 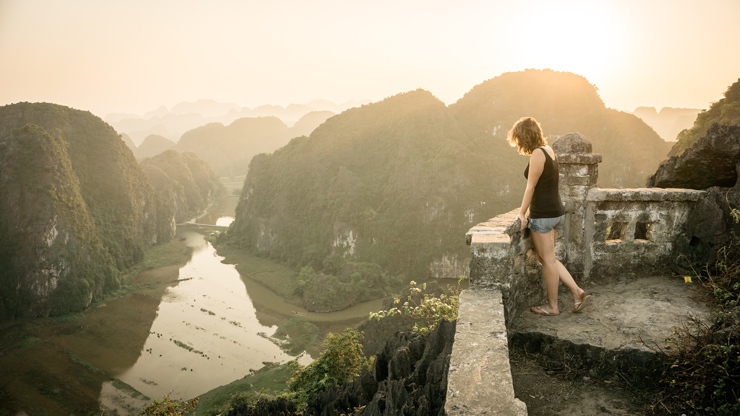 For the most beautiful panoramic view of the Tam Coc countryside you have to be at the top of Hang Mua. 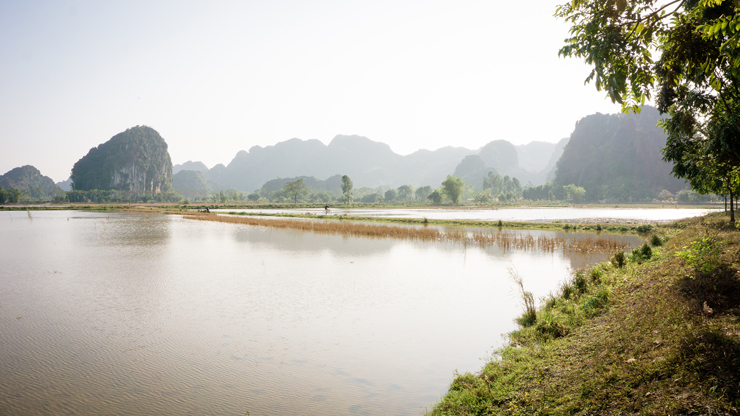 Observe the steep limestone cliffs towering above the rice fields, while the Ngo Dong River gracefully winds its way around them. Upon arrival, you immediately realize that this view isn’t given to you on a silver platter. 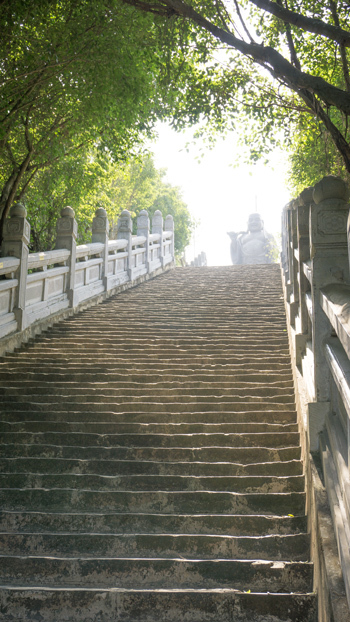 An impressive sequence of about 500 steps stands between you and this magnificent 360° view over the Red River Delta. Rest assured, your effort will be rewarded! The view of the mountain itself is also special. 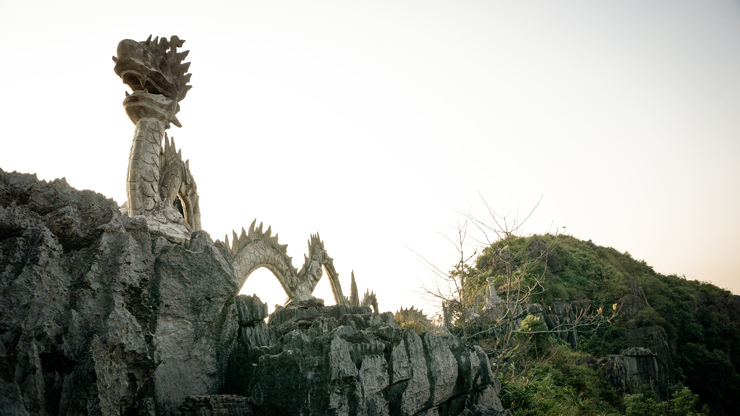 A typical pagoda and a unique dragon sculpture flaunt on the ridge of the mountain. Especially at sunset they create a magical contrast with the warm sky. The entrance fee to the domain is 100,000 VND per person. For your information: this place is also often referred to as Lying Dragon Mountain or Mua Caves, although the caves in itself aren’t particularly that interesting. Bai Dinh is not just a pagoda. It is an impressive temple complex including a 13-storey stupa, a 10-meter high bronze Buddha statue and two 1.7 km long corridors with 500 Arhat statues. All this is surrounded by inviting parks and caves in various sizes. With a total area of no less than 539 hectares, Asia’s largest pagoda definitely has something to offer. Although most of the Bai Dinh Pagoda complex was built recently (2008), the traditional identity of the old pagoda has been well integrated into the monumental architecture of the new one. 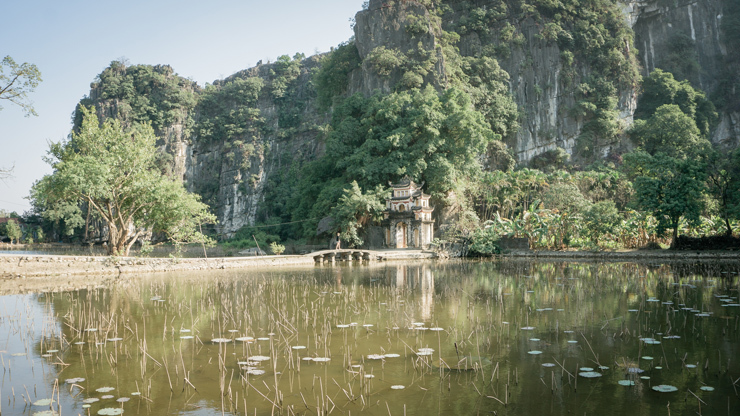 Resting on the green slope of the Bai Dinh mountain, the Bai Dinh Pagoda also offers beautiful views with in the background the Dam Thi lake and the beautiful karst landscape of Ninh Binh. Needless to say this makes a walk through this domain even more worthwhile. You can easily spend a few hours here, so take your time. The entrance is free, though they charge 20,000 VND for a parking spot for your motorbike or bicycle. As monumental and majestic as Bai Dinh Pagoda is, so modest and charming is Bich Dong Pagoda. It is exactly this fascinating contrast that makes a visit to both a must. Bich Dong was built in 1428 on the limestone rocks of Truong Yen and consists of 3 ancient pagodas in perfect harmony with the surrounding nature. You’ll be treated to some nice views. Additionally, you can also explore some caves. 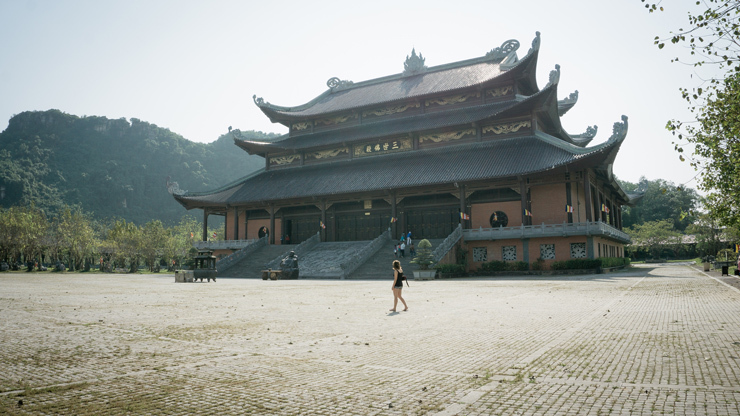 Given the small scale, a visit to the Bich Dong Pagoda shouldn’t take more than an hour. 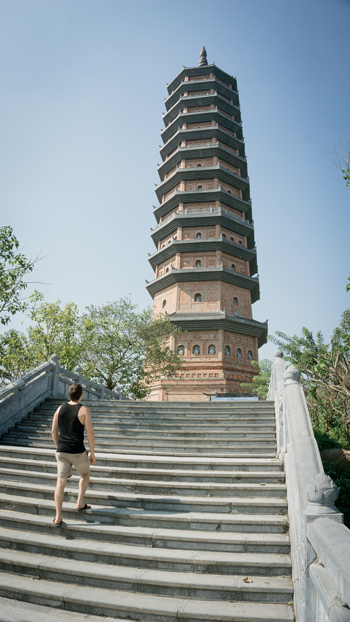 The pagoda, however, is a stone’s throw from the Tam Coc countryside, so you can perfectly combine your visit with a bike ride through the rice fields. This can take as long as you want! Again, there is no entrance fee, but they charge 5,000 VND to park your motorbike or bicycle. From Hanoi and Halong Bay you’re a 3 hour drive away from Ninh Binh. Bus tickets can easily be bought on the spot. We traveled from Cat Ba to our homestay in Tam Coc for 180,000 VND or about 8 USD. If you are traveling from Hoi An, Danang or Hue, we recommend the night train. This is not only an experience in itself but also saves the valuable time during the day. For example, Da Nang is about 14 hours away. When traveling by train, it is safer to book your ticket in advance. The best site for doing this is Baolau.com: reliable, convenient and often the cheapest. Choose a soft sleeper: your back will thank you.